Key Senate Democrats are rejecting Republican calls to enact additional forest management reforms in response to the wildfires consuming swaths of the West. House Republicans, including Natural Resources Chairman Rob Bishop of Utah and Energy and Commerce Chairman Greg Walden of Oregon, have been beating the drum for more change in recent days, calling for the farm bill conference to adopt provisions from a controversial House-passed measure, H.R. 2936, that would allow more logging and limit legal challenges to management projects (E&E Daily, Aug. 16). But Sen. Debbie Stabenow of Michigan, a member of the Energy and Natural Resources Committee and the top Democrat on the Agriculture panel, said yesterday she didn't see much appetite for addressing forest management in the farm bill conference. "We made reforms when we passed the fire package, and so I don't see other proposals beyond what we've done," she told E&E News yesterday. Sen. Maria Cantwell (D-Wash.), the ranking member on the Energy panel, signaled yesterday that she was content for now with the limited forest management reforms that were included in the omnibus spending measure in March, which ends the practice of "fire borrowing" — raiding other accounts to pay for wildfire suppression — and allows for limited categorical exclusions from environmental reviews. 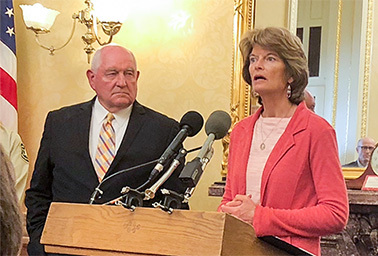 "We just gave them some really important tools — important enough that they wanted to come down and talk about them," Cantwell told E&E News after appearing at an event with Agriculture Secretary Sonny Perdue on wildfires. "So they should move forward on that." During yesterday's event, the Forest Service unveiled a strategy for improving collaboration with state and tribal governments in fighting wildfires that includes the management reforms agreed to earlier this year. That plan drew rare praise from green groups that often clash with the administration (E&E News PM, Aug. 16). Energy and Natural Resources Chairwoman Lisa Murkowski (R-Alaska) said she would like to see more management reforms enacted, citing policies she unsuccessfully pushed in the omnibus talks earlier this year, including broader use of categorical exclusions and provisions to allow more logging in the Tongass National Forest in her state, which she noted is threatened by a nearby fire burning across the Canadian border. Democrats opposed those changes earlier this year, resulting in the more limited reforms that were signed into law in March. 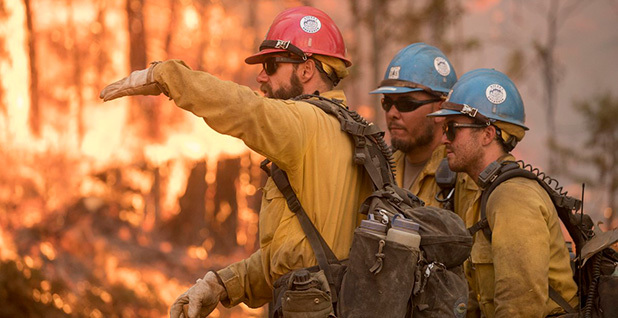 Senate Democrats yesterday said they expect that the administration may have to request additional funds from Congress before the end of the fiscal year, citing the dwindling of the extra $500 million appropriated for wildfire suppression in the omnibus. "I think they are going to break through the amount of money they have based on everything I am hearing," said Sen. Tom Udall of New Mexico, the top Democrat on the Interior-Environment Appropriations Subcommittee. "We are maxed out on personnel, we are getting people from other countries," he said. "They have done that in the past, but my understanding is we are really pushing the envelope in terms of the personnel and the budget." Sen. Ron Wyden (D-Ore.), who also appeared at yesterday's event and said earlier this week that he expected a supplemental request would be necessary before the Sept. 30 end of the fiscal year, signaled he would focus his legislative efforts on securing more funds. "I'll do everything I can to make sure the communities get what they need," Wyden said. Perdue, who last month submitted to Congress a plan to transfer up to $555 million from other accounts to cover wildfire costs, said yesterday the department is closely watching its fire accounts to see whether it can get by without a supplemental. "I ask these guys on a weekly basis are we going to make it through to Sept. 30, and we're calculating that," he told reporters. Perdue noted that the wildfire fund created by the omnibus doesn't start until Oct. 1, 2020, meaning that fire borrowing will continue until then. "So we'll have to still look toward transferring money from our operating budgets into fire suppression this year," he said. "Hopefully, refilling some of that in there and appealing to Congress again to backfill some of those funds that we borrowed in the FY19 budget."